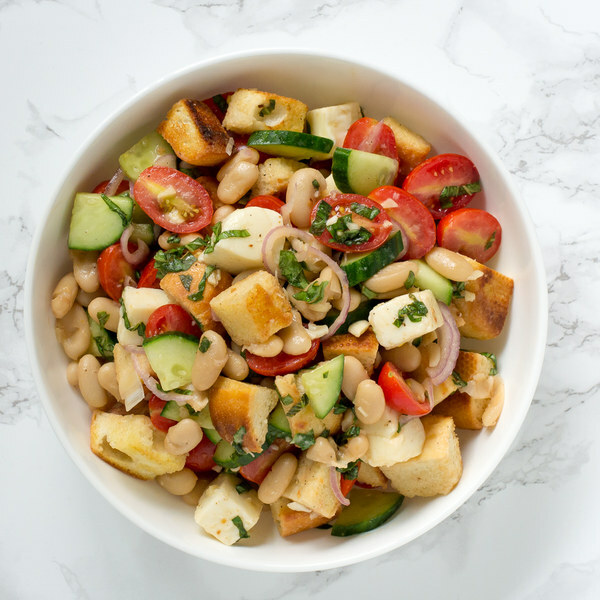 ← Tuscan Panzanella Salad with White Beans. Trim off and discard the root ends of the garlic; peel and mince or press the garlic. Transfer to a large salad bowl. To the garlic, add olive oil, red wine vinegar, Dijon, salt, and pepper; whisk together. Trim off and discard the ends of the cucumber; quarter the cucumber lengthwise, then slice crosswise into ¼-inch-thick pieces at an angle. Add to the salad bowl. Halve the grape tomatoes and add to the salad bowl. Pick the basil leaves off the stems; discard the stems and slice the leaves into a chiffonade by stacking them and rolling tightly into a cigar, then slicing crosswise into thin ribbons. Add to the salad bowl. Trim off and discard the ends of the shallots; peel and halve the shallots lengthwise, then thinly slice crosswise into half-rounds. Add to the salad bowl. Large dice the mozzarella into ¾-inch cubes and add to the salad bowl. Large dice the buns or rolls into ¾-inch cubes. Once the skillet is hot, add the bread cubes and cook, stirring frequently, until toasted and browned, 4 to 6 minutes. Transfer to a bowl. Once the bread has been transferred, add the beans to the skillet and season with salt and pepper; cook until heated through, 1 to 2 minutes. Add the beans and bread cubes to the salad bowl; toss to combine. To serve, divide the salad between plates or bowls. Enjoy!